Writer Phyllis Koppel is the author of "The Story of Two Old Suitcases". You can get it on Kindle from Amazon.com and in paperback version from Blurb books. In this story, Phyllis Koppel relates the plight of Melanie Warden, a woman consumed by religious beliefs and her charismatic husband. They try to raise a Christian family but complications always appear. Read more by pressing the button text. ​"Dead boy in a suitcase: Toronto-born mom says she’ll be judged by God"
Arberto and Melanie Warden live one spine-tingling step ahead of the law. Wanted by police in Toronto, Canada and Kingston, Jamaica, they cocoon their family under the blanket of sanctimonious extremism. In both countries, their neighbours think of the Wardens as pillars of the community. Meticulously clean and well spoken, the seemingly perfect couple volunteer to conduct workshops for teens at risk. However, as Arberto’s power rises, so does his fanaticism and burgeoning ego. The terrifying inner-workings of the psychopathic family are uncovered by a small but vociferous group in their church. Anguishing under escalating pressure, the Wardens respond to satanic threats deep in their psyche to commit two separate chilling crimes. Arberto abandons his infant girl under a freezing stairwell in Toronto and seals his son in a suitcase when the child is poisoned in Jamaica. In a tragedy of errors, none of these true crimes finds rightful justice. You do not have to own a Kindle to be able to read the book. You do need to download the Kindle software and read it on your computer or tablet. get a HARD COPY HERE! WILL YOU READ THIS STORY? Read what people are saying about The Story of Two Old Suitcases! The title "Two Old Suitcases" made me want to find out what the book was about. I wasn't expecting what opened up in the pages. The story unfolded with emotion and desire to see what would happen next. I think it will make a great movie. I will be watching for more books by Phyllis Koppel. The title and cover intrigued me, so I thought I'd give this book a try...and I loved it! It was a great glimpse into a different world that I'm sure exists, but I have no connections to at all. The book really did capture my interest right away with the opening scene and set the stage for the reader to wonder how that situation came to be. I don't know how new writers break into the field with their first book, but I've bought some inexpensive books on Amazon (less than $5) that were not nearly as good as 'The Story of Two Old Suitcases'! Great first effort! 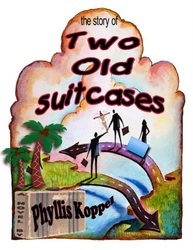 I recently read The Story of Two Old Suitcases by Phyllis Kopper and I have to admit, I was a little intrigued by the book title so I just had to know what it was all about. Well, I certainly wasn't expecting what I got. This book is not only intriguing but interesting as it delves into a really dark world. It tells a dark story that is supposedly based on true events. All in all, a good book that I would recommend for someone looking for a good read. I was intrigued by the book title, but I was surprised to find out it was written like a thriller. Although I knew how the story ends, the author of the book Phyllis Koppel, managed to keep me in suspense throughout all the story. The dark story, based on facts describes a declining process and shows how true and naive faith can lead to true hell. I believe the book will make a great movie, which I will surely would love to see. I will look forward for Phyllis Koppel next books to arrive shortly.